Flavius Aetius had the most liked content! The Yuezhi were Tocharian. The theory is that they were related to the Kushans. My understanding though is that there's very little evidence of Tocharian in the Kushan language which is a massive problem with that theory. So: Yes the Xiongnu and the Huns were also different in many ways. But the steppes were more about identity than ethnicity. RE the Hepthaltites: They weren't Xiongnu, they were Hua, a vassal people of the Rouran. Or at least that's the best theory we have right now. They were definitely some sort of early Turkic nomad like the Huns, Oghurs, etc. As for Haplogroup Q-M242... yes Y-Chromosomal haplogroups tend to spread really easily. The difference is that the Huns from sites such as Barkol, etc. have consistently expressed Q-M242 M25 L-712 thru L-715 which are consistent with Yeniseian peoples. The issue is that we have a rather limited sample size. The Huns also used infantry. They were recruited from their vassal states, and the Xiongnu vassalized many principalities in Xinjiang (the Tarim Basin and surrounding area). There would obviously be a lot of variation from region to region but vassals from a wide area definitely supplemented the steppe nomads themselves, some coming from the Forest zone of South Siberia. Chinese sources admittedly aren't my area, I deal with the European Huns mostly. That being said we know of several steppe nomad fortresses, namely Igdui-Kala in Kazakhstan, which dates to the 4th-5th centuries AD and is probably Hunnic. If you can provide me more info about said fortress and Zhao Xin, I can probably find more info on it for you. Yes. Ho boy, So as an actual Hun Historian let's clear up a few things: 1. The Xiongnu and the Huns were the same people. The word has a Yeniseian and Old Turkic mixed origin as it relates to both the ruling dynasty of the Xiongnu (a Yeniseian people) and the Old Turkic name for the Ongi River in Mongolia. We don't know what it means other than that it was a dynastic name. Xiongnu is pronounced "Hongna" and was transmitted over the Himalayas or via sea trade to India and transliterated into Sanskrit, before coming up from India into Sogdian, and then spreading into Bactrian Greek as Ounna, where it became Ounnoi in Roman Greek (Romeika), and then Hunni in Latin. 2. The Huns themselves are directly related. 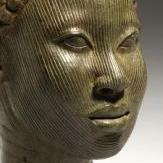 Huns can be identified by the Haplogroup Q-M242. Some of you here might know that's weird because Q-M242 is Native American DNA. It's also Yeniseian DNA, with the Kettic people having the highest concentration at 99%, and high concentrations east into Beringia, where the Yeniseians and the Dene people separated about 18,000 years ago. However, the majority of the Huns that entered Europe were not Yeniseian although most had some percentage of Yeniseian DNA and ancestry. They also no longer spoke Yeniseian (Xiongnu), but now spoke Oghuric Turkic, with many Yeniseian loanwords, and this was the language the Romans identified as Hunnic and the people the Romans called Hunnic. They were the same identity as Xiongnu, but with many changes since the days of Modun Chanyu in the 3rd century BC. 3. If you're considering Steppe Nomad factions, then they should be: Scythians (who are related to the Karluk people) Sarmatians/Alans (Also Indo-Iranian nomads like the Scythians) Xiongnu/Huns (The same people, effectively. The last of the Yeniseian nomads and the first of the Turkic-speaking nomads). 4. If you have questions I can probably answer any of them about the Huns and I know a lot about the Alans too (Scythian is a bit beyond my usual area but I know more than most). I haven't bothered to read all of this thread but feel free to ask. Flavius Aetius replied to Usac's topic in 1,000 A.D.
Goths would work just as well for Vandals. The Khazars I think are already being grouped underneath the Avars, which will cover all the Gok-Turkic factions. 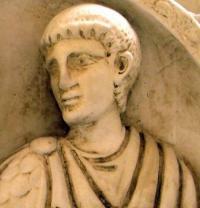 Flavius Aetius replied to niektb's topic in 1,000 A.D. Agreed, sub-factions could work. Or make their units recruitable through a scenario-only building like the Stoa can recruit Theurophoroi. The army of Heraclius' time wasn't much different than the army of Justinian. The difference came when Heraclius established the Theme system in the last year of his reign. Yeah, it's supposed to represent the evolution of the Roman Skoutatos. The one on the left is 6th century, the one in the middle is 8th century, and the one on the right is 10th century. The shield pattern on the right is actually applicable to all three unit models, but the patterns on the left are not. They all have trousers called Feminalia, which were tight fitting linen trousers (but not like, "tights" tight fitting). The 6th century guy is wearing Braccae, which were looser. I didn't put leg armor (Greaves) on any of them. And chainmail is actually the heaviest of the armors shown. The one in the middle is thick quilted linen (probably at least an inch thick) and the one on the right is Lamellar. We were aiming to cover the Majority of the period, with Thematic Byzantine (Nikephorian more or less). These unit types are applicable from about 638 AD almost all the way to 1071 AD. Although the Justinian and Heraclian Armies were important, they are too early for complete coverage of the Roman Era, although through unit experience upgrades earlier style units can be represented (I will post that picture I drew in a few minutes here, it's scanning). Flavius Aetius replied to NoMolester's topic in 1,000 A.D.
Germanic Tribes Were: Franks Lombards Goths Saxons And of course all the ones not on the list. Celtic was a different culture completely. Some Dates: Franks: They form in the year 297-ish, and I'd cut it off at Clovis' reign in 480's. Saxons: The Saxons from about 353 or so, and I'd cut it off at the Battle of Mount Badon in 483 (I think it is) Suebes: Suebes are a generic culture that last a very, very long time. The beginnings of the Suebic culture date to around almost 250 BC, and last until almost 500 AD. They would be divided into several periods: Early250-1), Middle (1-250), and Late (250-500). The Suebes included the Quaddi, Marcomanni, Alemanni, Asdingi and Silingi Vandals, Suebes, and uh... others. After about 500 Ethnogenesis splits it up into individual cultures like Bavarian and whatnot. What is the theme of the next update? That will help determine the name. Flavius Aetius replied to Radagast. 's topic in 1,000 A.D. The Two Sicilies thing is my fault. They should just fall under "Norman" Yes, we should add a generic "Crusader States" Faction for Balkans, Middle Eastern, and Teutonic Crusaders. Updating the list I made. Should throw in "Illyrian Liburna" under the Illyrian roster.